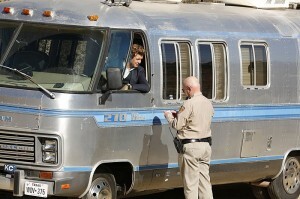 “So you are Patrick Jane. How is Jane going to deal with his demons, and with a (fake?) psychic? 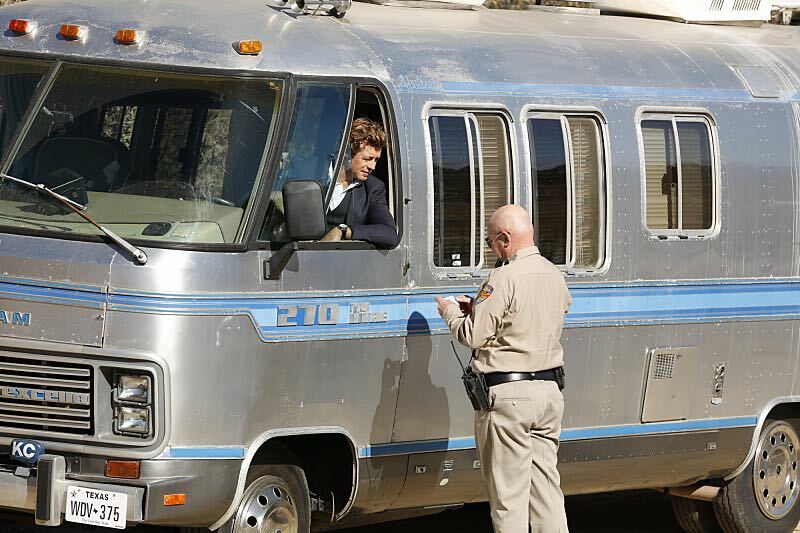 Read on for our recap of the new The Mentalist episode, “Byzantium”. The FBI team is called to investigate the death of a couple, young college students. It seems there was no reason somebody would want them dead. Both the victims are missing a fingernail. The case seems and feels pretty strange, and Abbott would like to have Jane’s insight, but Jane is nowhere to be found. After Vega’s funeral he left, and he’s not answering Lisbon’s calls. Jane’s insight would be really helpful, especially when a young man, named Gabriel, who claims to be psychic, contacts the FBI about the murder of the couple. Abbott and Lisbon talk with him, and Gabriel knows about the detail of the fingernail. He also says he has spoken to a man, something was wrong with him, but it seems like Gabriel can’t give a proper description of the man. Lisbon is obviously suspicious of the young man, she knows better than to believe someone who claims to be a psychic, as she says: “Years of experience”. The details Gabriel knew though, weren’t released to the press. Either he knows someone who’s working on the investigation, or he is the killer. Jane is forced to come back, and we find out he spent some “quality time” in Arizona, at the Grand Canyon. J: Well, you knew I’d be back. L: No, I didn’t. I can’t read minds. The first time I called you, I thought, “he missed my call”. The second time, I thought, “he’s busy”. The third time, I thought, “he’s dead”. He is dead in a ditch on the side of the road”. J: I didn’t mean to scare you. L: Well, you did scare me. J: I’m working through something, and I just need space to think. L: We’re all upset. I can’t just run away from my work here. This job is too important to me. J: I just need some time. from you. Don’t ignore my phone calls. This dialogue reminded me so much of the Season 4 Finale “The Crimson Hat”. Jane disappeared for 6 months, to work on a plan to catch Red John. Lisbon doesn’t know where he is, if he’s fine or not, he doesn’t answer her calls. When they meet again, Lisbon’s reaction is quite similar to this one. Her frustration, her concern about his wellbeing, is very similar to her reaction in this episode. Moreover, Jane doesn’t answer his phone again, when Lisbon tries to call him again later. He’s drunk and the next morning he wakes up in a field. He doesn’t even know where he is. He has a chance encounter with a three legged dog, which leads him to find a nice piece of land for sale. In that moment, we see that something has changed in him… what has Jane finally realized? Back to the case, Jane has met Gabriel, and he believes he’s a fraud, but he also says that the young man is very good, very smart and controlled. Gabriel has led them to find other bodies, probably killed by the same person who killed the young couple, they miss a fingernail too. It looks like the FBI team is now dealing with a serial killer. But is Gabriel himself the serial killer? The young man claims that he just wants to help, and he talks to the media, saying that the serial killer is a man with an evil heart, with appetite to kill, and he’s not quite done yet. And indeed, the killer is not done, because later the team finds Gabriel’s sister dead, and Gabriel is dead too, tortured. The serial killer has left a mark, “fake” on his arm. Red John’s feelings, anyone? You talk bad about me on tv? I make you pay. What I really enjoyed in this episode were the scenes with Cho and Wylie. I like how their relantionship is evolving, and it looks like Wylie wants to continue what Vega wanted so much, a good career, being part of the team; trying to be a better a cop to honor her. Next week, The Mentalist is back with a 2 hour Series Finale, in which not only the team will have to catch the serial killer, but Jane and Lisbon will have to finally find a way to work out their problems. And what has Jane in mind exactly?